Friends, you are cordially invited to a night of interactive performances. 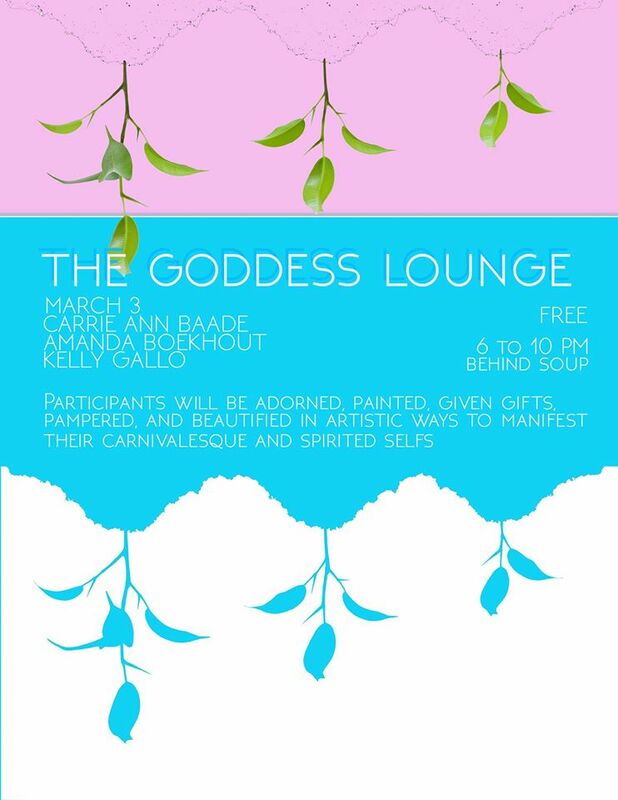 Enter “the Goddess Lounge”, Friday March 3rd, 6 to 10pm. Experience the art of adornment as you interact with artists who assist you in manifesting your divine feminine within. In deep reverence, this interactive emersion was inspired by Swoon’s Pearly’s Beauty Salon. Kelly Gallo, Amanda Boekhout, and Carrie Ann Baade are joined by many muses through out the night. “The Goddess Lounge is specific to spring and to the Divinity in each one of us. Dearing is strife and difficulties politically, we are most interested in connecting with people and engaging in a life affirming way. This performance artwork brings together the participants and performance artists who will be interacting with the public in an unexpected way reminiscent of happenings from the 1960s. First Friday is an essential part of this performance where herds of people unexpectedly emerge and enter into the experience. It is a gift as well as co-dependent of the participation of unexpected community members. It is an interactive environment of discovery and magic. Participants will be adorned, painted, given gifts, pampered, and beautified in artistic ways to manifest their carnivalesque and spirited selves.